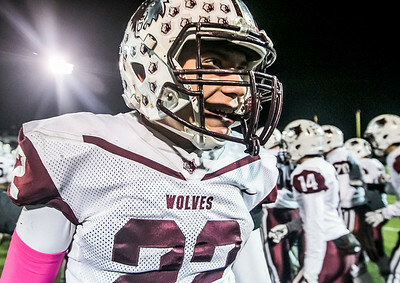 Sarah Nader - snader@shawmedia.com Prairie Ridge's Joe Perhats celebrates with the team after they won Saturday's Class 6A state semifinal game against Hoffman Estates Nov. 18, 2017. 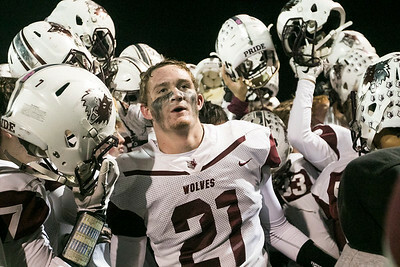 Prairie Ridge won, 42-21. 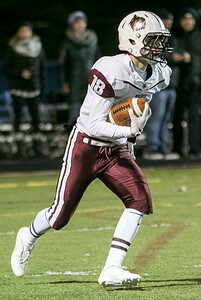 Sarah Nader - snader@shawmedia.com Prairie Ridge's Zach Gulbransen runs the ball during the first quarter at Saturday's Class 6A state semifinal game against Hoffman Estates Nov. 18, 2017. 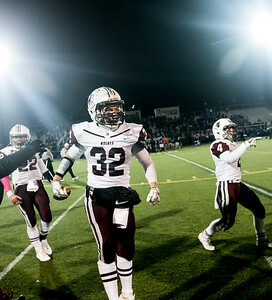 Prairie Ridge won, 42-21. 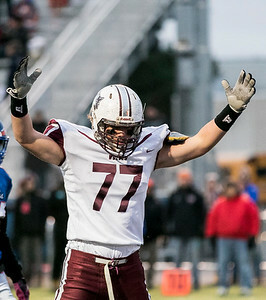 Sarah Nader - snader@shawmedia.com Prairie Ridge's Jeffrey Jenkins celebrates a touchdown during the first quarter at Saturday's Class 6A state semifinal game against Hoffman Estates Nov. 18, 2017. 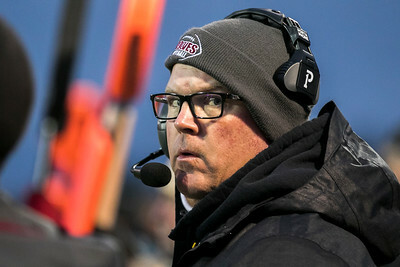 Prairie Ridge won, 42-21. 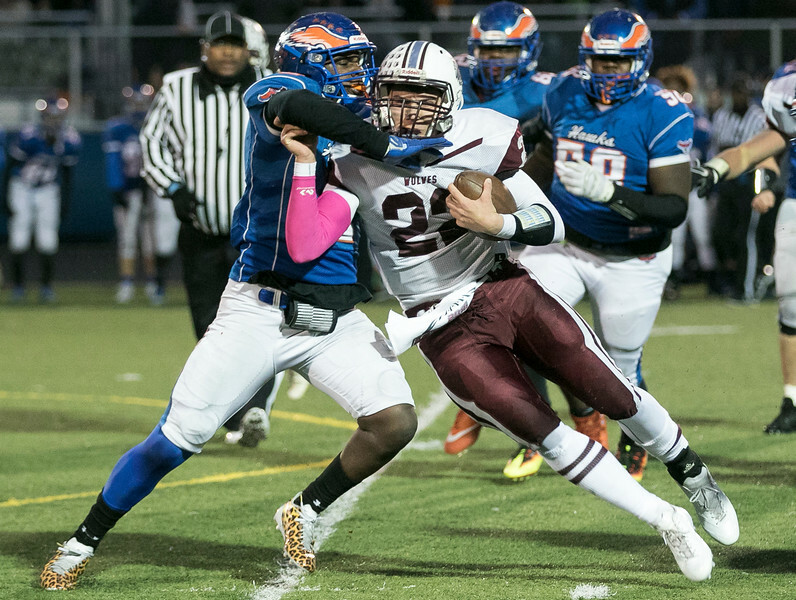 Sarah Nader - snader@shawmedia.com Prairie Ridge's Samson Evans pushes off Hoffman Estates' Jaylan Alexander during the second quarter at Saturday's Class 6A state semifinal game in Hoffman Estates Nov. 18, 2017. 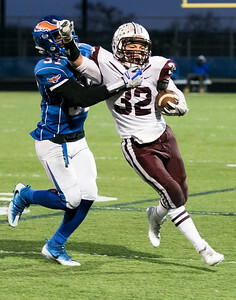 Prairie Ridge won, 42-21. 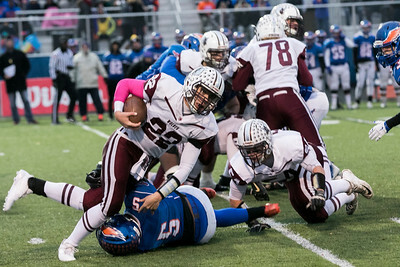 Sarah Nader - snader@shawmedia.com Hoffman Estates' Cameron Kindred (left) pushes Prairie Ridge's Zach Gulbransen out of bounds during the second quarter at Saturday's Class 6A state semifinal game in Hoffman Estates Nov. 18, 2017. 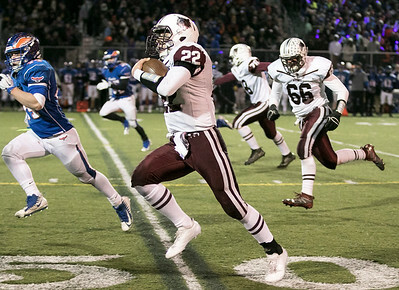 Prairie Ridge won, 42-21. 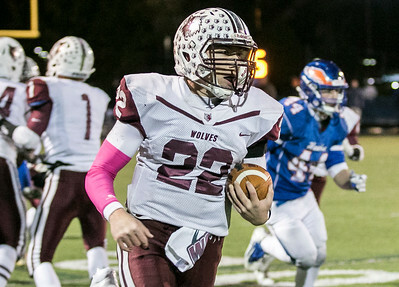 Sarah Nader - snader@shawmedia.com Prairie Ridge's Samson Evans runs the ball during the second quarter at Saturday's Class 6A state semifinal game against Hoffman Estates Nov. 18, 2017. Prairie Ridge won, 42-21. 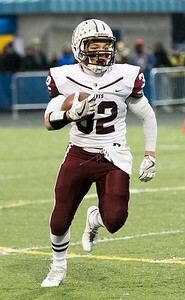 Sarah Nader - snader@shawmedia.com Prairie Ridge's Samson Evans runs the ball during the third quarter at Saturday's Class 6A state semifinal game against Hoffman Estates Nov. 18, 2017. Prairie Ridge won, 42-21. 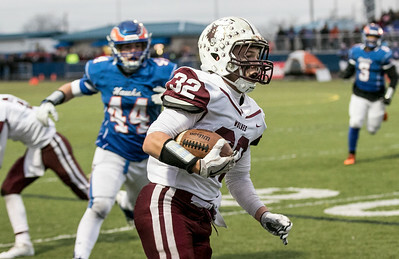 Sarah Nader - snader@shawmedia.com Prairie Ridge's Blake Brown runs the ball during the third quarter at Saturday's Class 6A state semifinal game against Hoffman Estates Nov. 18, 2017. Prairie Ridge won, 42-21. 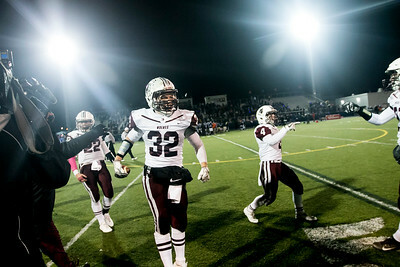 Sarah Nader - snader@shawmedia.com Prairie Ridge's Charles Salerno (center) celebrates with the football team during the final seconds of Saturday's Class 6A state semifinal game against Hoffman Estates Nov. 18, 2017. Prairie Ridge won, 42-21. 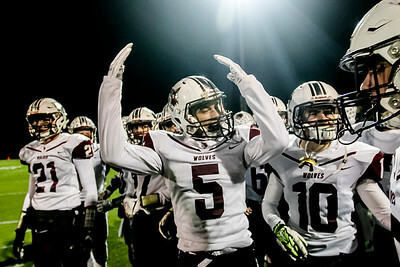 Sarah Nader - snader@shawmedia.com Prairie Ridge's Zach Gulbransen celebrates after the team won Saturday's Class 6A state semifinal game against Hoffman Estates Nov. 18, 2017. Prairie Ridge won, 42-21. Sarah Nader - snader@shawmedia.com Prairie Ridge's celebrates after the team won Saturday's Class 6A state semifinal game against Hoffman Estates Nov. 18, 2017. Prairie Ridge won, 42-21. 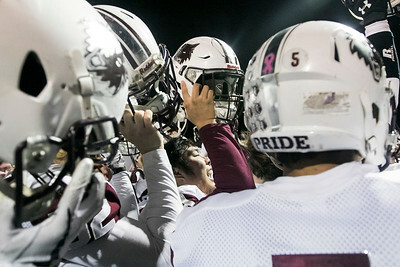 Sarah Nader - snader@shawmedia.com The Prairie Ridge football team celebrates after winning Saturday's Class 6A state semifinal game against Hoffman Estates Nov. 18, 2017. Prairie Ridge won, 42-21. 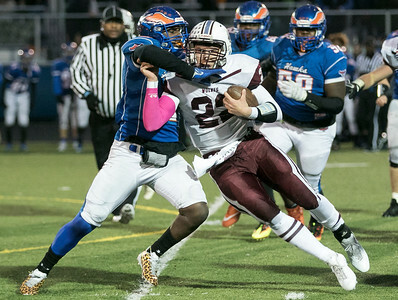 Sarah Nader - snader@shawmedia.com Prairie Ridge's Samson Evans is tackled by Hoffman Estates' Shawn Brown during the first quarter at Saturday's Class 6A state semifinal game in Hoffman Estates Nov. 18, 2017. Prairie Ridge won, 42-21. 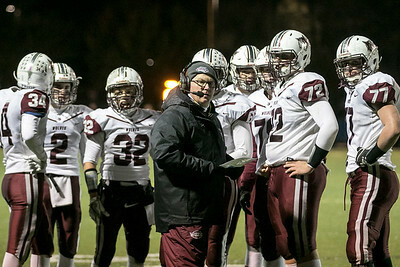 Sarah Nader - snader@shawmedia.com Prairie Ridge's head football coach Chris Schremp talks to the team during Saturday's Class 6A state semifinal game against Hoffman Estates Nov. 18, 2017. Prairie Ridge won, 42-21. 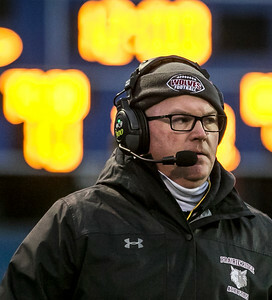 Sarah Nader - snader@shawmedia.com Prairie Ridge head football coach Chris Schremp during Saturday's Class 6A state semifinal game against Hoffman Estates Nov. 18, 2017. Prairie Ridge won, 42-21. Jaylan Alexander during the second quarter at Saturday's Class 6A state semifinal game in Hoffman Estates Nov. 18, 2017. 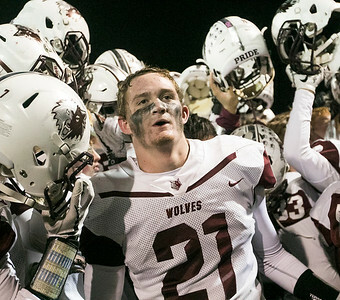 Prairie Ridge won, 42-21.